World 1- Tower is the fourth level and the tower of World 1, and subsequently, the first tower of New Super Mario Bros. The boss here is Bowser Jr. 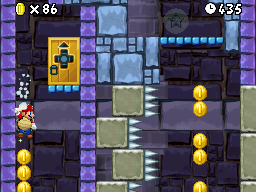 The player starts out on a rising and lowering platform if which the player stays on it for long enough it will go down and this will reveal four coins. Mario then progresses encountering the first Dry Bones of the tower and the game. The player then keeps on going up finding two ? Blocks, one containing a coin and the other either a Super Mushroom or a Fire Flower depending on what form Mario is. The player continues to progress up the tower but some platforms appear pushing out from the walls. If the player gets squashed in between the platforms, they lose a life. On the last platform, the player encounters another Dry Bones. 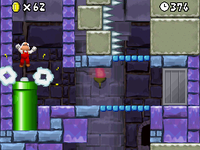 Still going up, the player has to jump up a couple of platforms, then they have to turn right encountering platforms trying to push down on Mario. The player continues to progress up finding finding another group of platforms. The player finally reaches to the last one which Mario is on top of the platforms, where they also encounter another Dry Bones. The player also finds a Star Coin and two blocks, one is a brick block and the other a ? block. The normal block contains coins while the other block contains either a Mushroom or a Fire Flower. The player progresses up finding platforms pushing out of the wall which if the player can pass them fast enough they appear as a stair case. The player has to go up it finding the player in between an unusable door and a Warp Pipe. The player can go into the warp pipe, which sshoot the player, making Mario reach the checkpoint. The player either go up towards the Door or go down to get more coins. If the player decides to go up, they find a warp pipe cannon that blasts Mario past a series of moving platforms. If the player times it right, Mario gets to the boss door easily. If not, the player loses a life by being crushed between the platforms. Here, there are two Super Dry Bones trapped in two enclosed platforms. The player also finds a ? Block, which contains either a Mushroom or Fire Flower. The player has to enter the door in order to progress. The player finds Bowser Jr., who challenges Mario to a battle. Bowser Jr. runs around the room, trying to run into Mario. After his first defeat, Bowser Jr. will then take Peach away with him to the castle of World 1. In order to reach the secret exit, Mario will have to be Shell Mario. In the room with the second Star Coin and shifting blocks, the player can find a gap that never closes on the right side of the room. The player has to enter the gap and jump upwards to find a 1-Up Mushroom, then the player has to jump onto five more blocks. The player has to start the Shell Dash. After destroying all the blocks, the player has to enter the pipe. Next the player will fall to the right after exiting. The player has to jump onto a block to grab another 1-Up while unlocking the Warp Cannon which will shoot the player all the way to World 5. Star Coin 1 - Guarded by a Dry Bones after a few sets of blocks. Star Coin 2 - In the upper left, there is a yellow door. Taking it will not only lead to a Star Coin, but also the secret exit. Star Coin 3 - Taking the path to the upper right will lead the bros. to this coin. This page was last edited on April 4, 2019, at 21:28.